Virgin Voyages keeps releasing new teases of Scarlet Lady, the first ever Virgin cruiser ship which is coming in 2020. They really do know how to keep the interest and now another new rendering video has been released of the Gym & Tonic bar! The cruise line continues to highlight the importance of keeping fit and staying healthy during a cruise. We’ve already covered videos from Virgin on even more workout spaces right here. A little apres workout cold pressed juice sipping at Gym & Tonic bar anyone? With the rate the Florida based cruise line is releasing new teases we’ll know even more in the coming weeks or months, not just about the Gym & Tonic bar but other spaces too. 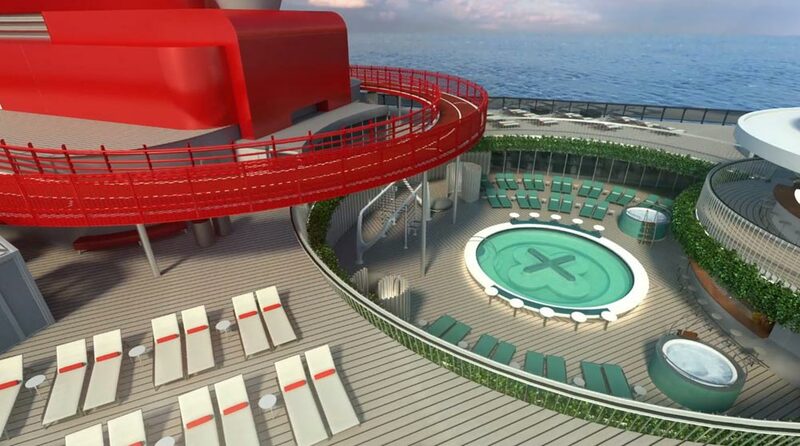 Don’t you feel all these renderings are part of a full virtual tour of the ship? Could be something which is coming! Scarlet Lady will be the first ever ship for Virgin and is currently under construction at the Fincantieri shipyard in Genoa, Italy. The ship will arrive in 2020 at 110,000 gross tons and with a guest capacity of 2,700. Scarlet lady will be for adults only and be based out of PortMiami sailing 7-day Caribbean cruises. To make sure you don’t miss any new updates about Virgin Voyages you can join our new dedicated Facebook group.